Cheapeats, Inc. Blog » What’s Happening In NYC This Weekend? Night Market, a pop up featuring Asia Dog, Better Summer, Filled with Sweets, Hong Kong Street Cart, Imperial Woodpecker Sno-balls, Macaron Parlour, Nom Wah Tea Parlor, Spur Tree, Taikan Chicken and Taiwan Beer. Plus a DJ all night. Spend an evening abroad with out two-day festival showcasing street-inspired delicacies including pork belly buns, jerk wings, baby back ribs, Asian hot dogs, Vietnamese summer rolls, snow pea shrimp dumpling, macarons, whoopie pies, cupcakes and more. 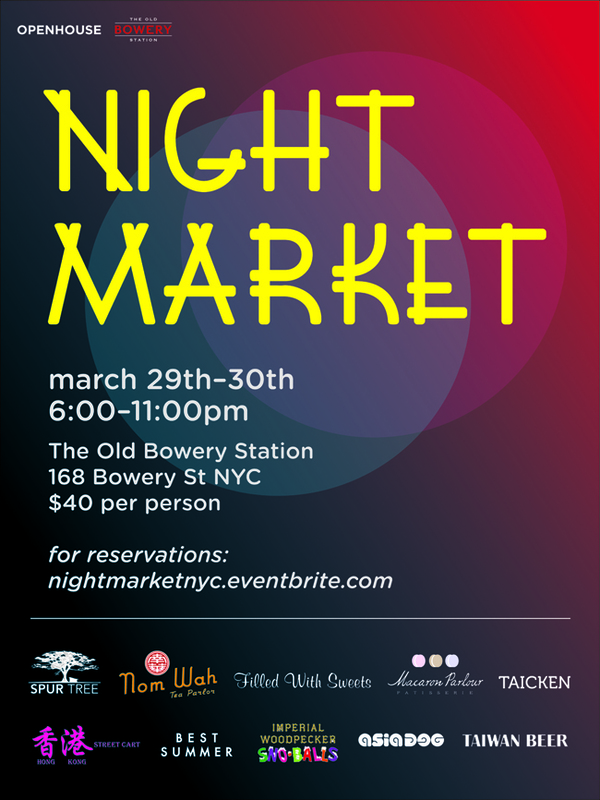 This entry was posted by Rosemarie on Monday, March 25th, 2013 at 8:17 pm	and is filed under Asian, Events, Manhattan, Nolita, Soho. You can follow any responses to this entry through the RSS 2.0 feed. You can leave a response, or trackback from your own site.